Most families will, at some point, have decided to holiday in France or have decided to drive through it to Spain or other parts of Europe or even further afield for their Summer break. To stay on the right side of the law in France, there are a few things you’ll need to prepare before you leave. It has beautiful countryside, great food and wine – and families love it. 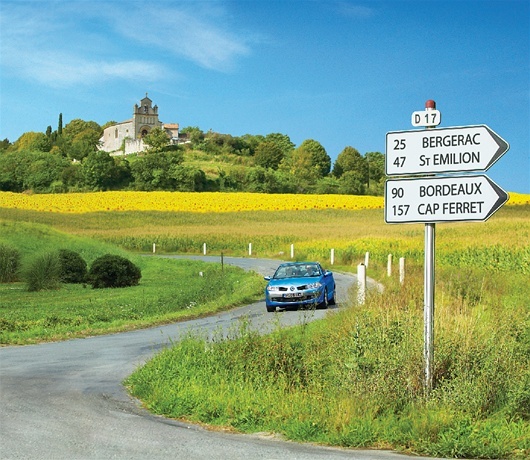 Whether you’re camping and canoeing in the Ardeche, driving through fields of lavender and old stone villages in Provence, visiting the Loire chateaux, sightseeing in the great cities or aiming for the Cote D’Azur’s sun-baked beaches, you need to follow the local driving laws. From headlight beam deflectors for right-hand drive cars, a ban on hands-free devices, different speed limits, to a lower alcohol limit for driving, to the things you need to carry in your car, don’t just set off and hope for the best. * Two NF certified disposable breathalysers (French version), for example, AlcoSense sells a twin pack for £4.99 online or in Halfords. * Tell your car insurers that you’ll be driving abroad, some policies will not cover you as standard and require your dates of travel. * Don’t use your mobile phone when driving unless you have a built-in fully integrated hands free kit in the car. Bluetooth earpieces or wired earpieces are strictly forbidden and receive a €135 fine. * Drive on the right and watch your speed. Speed camera detectors are illegal in France. By law, if your sat nav comes with them or with camera locations, you are required to disable the alerts. Failure to do this can result in a €1,500 fine. * Driving in Paris requires you to buy a clean air sticker for your car that shows how much you pollute. Buy these online for around 4 euros/£3.50. If you fail to do so and you’re stopped, there is a fine of between 68 and 135 euros awaiting you. Don’t drink and drive at all. And be aware of ‘morning after’ drink driving. It’s easier to be over the limit the next day without realising than you might think. For a start, it is illegal to drive in France without an NF approved breathalyser in your car. AlcoSense single use NF breathalysers (French version and sold in a twin pack for £4.99 online and available in Halfords) are one of only a couple of products worldwide to meet and exceed the NF standard. Derivatives of these breathalysers are used by police forces in over 30 countries including the Police Nationale and Gendarmerie Nationale in France. The AlcoSense single use NF breathalyser will quickly and accurately show you if you are under or over the lower French drink drive limit with a simple colour change. The further up the graduated tube the green colour appears, the greater the concentration of alcohol you have in your system. If the green reaches the line, you’re over the French limit.